Cube Relay 120VAC 2PDT 10 Amp - Ice cube control relay, 120VAC coil, DPDT, 10A contact rating, with LED indicator. Purchase SQL08D mounting socket separately. Cube Relay 24VDC 2PDT 5 Amp - Ice cube control relay, 24VDC coil, DPDT, 5A contact rating, with LED indicator. Purchase SQM08D mounting socket separately. Cube Relay 24VDC 2PDT 5Amp Diod - Ice cube control relay, 24VDC coil, DPDT, 5A contact rating, with LED indicator and diode protection. Purchase SQM08D mounting socket separately. Cube Relay 240VAC 2PDT 5 Amp - Ice cube control relay, 240VAC coil, DPDT, 5A contact rating, with LED indicator. Purchase SQM08D mounting socket separately. Cube Relay 120VAC 4PDT 3 Amp - Ice cube control relay, 120VAC coil, 4PDT, 3A contact rating, with LED indicator. Purchase SQM14D mounting socket separately. Cube Relay 24VDC 4PDT 3 Amp - Ice cube control relay, 24VDC coil, 4PDT, 3A contact rating, with LED indicator. Purchase SQM14D mounting socket separately. Cube Relay 24VDC 4PDT 3Amp Diod - Ice cube control relay, 24VDC coil, 4PDT, 3A contact rating, with LED indicator and diode protection. Purchase SQM14D mounting socket separately. Cube Relay 240VAC 4PDT 3 Amp - Ice cube control relay, 240VAC coil, 4PDT, 3A contact rating, with LED indicator. Purchase SQM14D mounting socket separately. Cube Relay 120VAC 2PDT 5 Amp - Ice cube control relay, 120VAC coil, DPDT, 5A contact rating, with LED indicator. Purchase SQM08D mounting socket separately. Cube Relay 24VDC 2PDT 10 Amp - Ice cube control relay, 24VDC coil, DPDT, 10A contact rating, with LED indicator. Purchase SQL08D mounting socket separately. Cube Relay24VDC 2PDT 10Amp Diod - Ice cube control relay, 24VDC coil, DPDT, 10A contact rating, with LED indicator and diode protection. Purchase SQL08D mounting socket separately. Cube Relay 240VAC 2PDT 10 Amp - Ice cube control relay, 240VAC coil, DPDT, 10A contact rating, with LED indicator. Purchase SQL08D mounting socket separately. Cube Relay 120VAC 4PDT 10 Amp - Ice cube control relay, 120VAC coil, 4PDT, 10A contact rating, with LED indicator. Purchase SQL14D mounting socket separately. Cube Relay 24VDC 4PDT 10 Amp - Ice cube control relay, 24VDC coil, 4PDT, 10A contact rating, with LED indicator. Purchase SQL14D mounting socket separately. CubeRelay24VDC 4PDT 10Amp diod - Ice cube control relay, 24VDC coil, 4PDT, 10A contact rating, with LED indicator and diode protection. Purchase SQL14D mounting socket separately. Cube Relay 240VAC 4PDT 10 Amp - Ice cube control relay, 240VAC coil, 4PDT, 10A contact rating, with LED indicator. Purchase SQL14D mounting socket separately. Ice cube control relay, 12 VD - Ice cube control relay, 12VDC coil voltage, SPDT, 15A contact rating, with LED indicator and push-to-test button. Purchase 781-1C-SKT mounting socket separately. Ice cube control relay, 12 VA - Ice cube control relay, 12VAC coil voltage, SPDT, 15A contact rating, with LED indicator and push-to-test button. Purchase 781-1C-SKT mounting socket separately. CubeRelay 24VDC 1PDT 15A push - Ice cube control relay, 24VDC coil voltage, SPDT, 15A contact rating, with LED indicator and push-to-test button. Purchase 781-1C-SKT mounting socket separately. CubeRelay 24VAC 1PDT 15A push - Ice cube control relay, 24VAC coil voltage, SPDT, 15A contact rating, with LED indicator and push-to-test button. Purchase 781-1C-SKT mounting socket separately. CubeRelay 120VAC 1PDT 15A push - Ice cube control relay, 120VAC coil voltage, SPDT, 15A contact rating, with LED indicator and push-to-test button. Purchase 781-1C-SKT mounting socket separately. CubeRelay 240VAC 1PDT 12A push - Ice cube control relay, 240VAC coil voltage, SPDT, 15A contact rating, with LED indicator and push-to-test button. Purchase 781-1C-SKT mounting socket separately. Ice cube control relay, 12 VD - Ice cube control relay, 12VDC coil voltage, DPDT, 15A contact rating, with LED indicator and push-to-test button. Purchase 782-2C-SKT mounting socket separately. Ice cube control relay, 12 VA - Ice cube control relay, 12VAC coil voltage, DPDT, 15A contact rating, with LED indicator and push-to-test button. Purchase 782-2C-SKT mounting socket separately. CubeRelay 24VDC 2PDT 15A push - Ice cube control relay, 24VDC coil voltage, DPDT, 15A contact rating, with LED indicator and push-to-test button. Purchase 782-2C-SKT mounting socket separately. CubeRelay 24VAC 2PDT 15A push - Ice cube control relay, 24VAC coil voltage, DPDT, 15A contact rating, with LED indicator and push-to-test button. Purchase 782-2C-SKT mounting socket separately. CubeRelay 120VAC 2PDT 15A push - Ice cube control relay, 120VAC coil voltage, DPDT, 15A contact rating, with LED indicator and push-to-test button. Purchase 782-2C-SKT mounting socket separately. CubeRelay 240VAC 2PDT 15A push - Ice cube control relay, 240VAC coil voltage, DPDT, 15A contact rating, with LED indicator and push-to-test button. Purchase 782-2C-SKT mounting socket separately. Ice cube control relay,12VDC - Ice cube control relay, 12VDC coil voltage, 3PDT, 15A contact rating, with LED indicator and push-to-test button. Purchase 783-3C-SKT mounting socket separately. Ice cube control relay, 12 VA - Ice cube control relay, 12VAC coil voltage, 3PDT, 15A contact rating, with LED indicator and push-to-test button. Purchase 783-3C-SKT mounting socket separately. CubeRelay 24VAC 3PDT 15A push - Ice cube control relay, 24VDC coil voltage, 3PDT, 15A contact rating, with LED indicator and push-to-test button. Purchase 783-3C-SKT mounting socket separately. CubeRelay 24VAC 3PDT 15A push - Ice cube control relay, 24VAC coil voltage, 3PDT, 15A contact rating, with LED indicator and push-to-test button. Purchase 783-3C-SKT mounting socket separately. CubeRelay 120VAC 3PDT 15A push - Ice cube control relay, 120VAC coil voltage, 3PDT, 15A contact rating, with LED indicator and push-to-test button. Purchase 783-3C-SKT mounting socket separately. CubeRelay 240VAC 3PDT 15A push - Ice cube control relay, 240VAC coil voltage, 3PDT, 15A contact rating, with LED indicator and push-to-test button. Purchase 783-3C-SKT mounting socket separately. Ice cube control relay, 12 VD - Ice cube control relay, 12VDC coil voltage, 4PDT, 15A contact rating, with LED indicator and push-to-test button. Purchase 784-4C-SKT-1 mounting socket separately. Ice cube control relay, 12 VA - Ice cube control relay, 12VAC coil voltage, 4PDT, 15A contact rating, with LED indicator and push-to-test button. Purchase 784-4C-SKT-1 mounting socket separately. CubeRelay 24VDC 4PDT 15A push - Ice cube control relay, 24VDC coil voltage, 4PDT, 15A contact rating, with LED indicator and push-to-test button. Purchase 784-4C-SKT-1 mounting socket separately. CubeRelay 24VAC 4PDT 15A push - Ice cube control relay, 24VAC coil voltage, 4PDT, 15A contact rating, with LED indicator and push-to-test button. Purchase 784-4C-SKT-1 mounting socket separately. CubeRelay 120VAC 4PDT 15A push - Ice cube control relay, 120VAC coil voltage, 4PDT, 15A contact rating, with LED indicator and push-to-test button. Purchase 784-4C-SKT-1 mounting socket separately. CubeRelay 240VAC 4PDT 15A push - Ice cube control relay, 240VAC coil voltage, 4PDT, 15A contact rating, with LED indicator and push-to-test button. Purchase 784-4C-SKT-1 mounting socket separately. Bus connector pkg=10 (5pair) - Bus bar used to connect multiple octal relays in parallel. 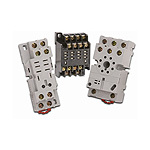 Package includes 5 pair of bus bars to connect up to 5 relays together. ProtectDiode for 784&750 relay - Protection diode module for 783, 784 and 750 series relays. Package includes 5 modules. Protect Diode for 782 relays - Protection diode module for 782 series relays. Package includes 5 modules. ProtectDiode for 784&750 24VAC - MOV module for 783, 784 and 750 series relays that operate at 24VAC coil voltage. Package includes 5 modules. ProtectDiode-784&750 120VAC - MOV module for 783, 784 and 750 series relays that operate at 120VAC coil voltage. Package includes 5 modules. ProtectDiode 784&750 240VAC - MOV module for 783, 784 and 750 series relays that operate at 240VAC coil voltage. Package includes 5 modules. ProtectDiode 782 reley 24VAC - MOV module for 782 series relays that operate at 24VAC coil voltage. Package includes 5 modules. ProtectDiode 782 relay 120VAC - MOV module for 782 series relays that operate at 120VAC coil voltage. Package includes 5 modules. MOV module 782 relay 240VAC - MOV module for 782 series relays that operate at 240VAC coil voltage. Package includes 5 modules. H782 Series Cube Relays - Ice cube control relay, hermetically sealed for hazardous locations, 12VDC coil voltage, 4PDT, 3A contact rating. Purchase 782-4C-SKT mounting socket separately. H782 Series Cube Relays - Ice cube control relay, hermetically sealed for hazardous locations, 12VAC coil voltage, 4PDT, 3A contact rating. Purchase 782-4C-SKT mounting socket separately. H782 Series Cube Relays - Ice cube control relay, hermetically sealed for hazardous locations, 24VDC coil voltage, 4PDT, 3A contact rating. Purchase 782-4C-SKT mounting socket separately. H782 Series Cube Relays - Ice cube control relay, hermetically sealed for hazardous locations, 24VAC coil voltage, 4PDT, 3A contact rating. Purchase 782-4C-SKT mounting socket separately. H782 Series Cube Relays - Ice cube control relay, hermetically sealed for hazardous locations, 120VAC coil voltage, 4PDT, 3A contact rating. Purchase 782-4C-SKT mounting socket separately. H782 Series Cube Relays - Ice cube control relay, hermetically sealed for hazardous locations, 240VAC coil voltage, 4PDT, 3A contact rating. Purchase 782-4C-SKT mounting socket separately. H782 Series Cube Relays - Ice cube control relay, hermetically sealed for hazardous locations, 12VDC coil voltage, 4PDT, 5A contact rating. Purchase 782-4C-SKT mounting socket separately. H782 Series Cube Relays - Ice cube control relay, hermetically sealed for hazardous locations, 12VAC coil voltage, 4PDT, 5A contact rating. Purchase 782-4C-SKT mounting socket separately. H782 Series Cube Relays - Ice cube control relay, hermetically sealed for hazardous locations, 24VDC coil voltage, 4PDT, 5A contact rating. Purchase 782-4C-SKT mounting socket separately. H782 Series Cube Relays - Ice cube control relay, hermetically sealed for hazardous locations, 24VAC coil voltage, 4PDT, 5A contact rating. Purchase 782-4C-SKT mounting socket separately. H782 Series Cube Relays - Ice cube control relay, hermetically sealed for hazardous locations, 120VAC coil voltage, 4PDT, 5A contact rating. Purchase 782-4C-SKT mounting socket separately. H782 Series Cube Relays - Ice cube control relay, hermetically sealed for hazardous locations, 240VAC coil voltage, 4PDT, 5A contact rating. Purchase 782-4C-SKT mounting socket separately. 4 Relay Card 24VDC SPDT 5A TY3 - Card relay (4 included), socket-mounted, 24VDC 200mW coil, SPST, 5A contact rating. TY3 relay remover and two (2) jumpers included. General purpose industrial control relays are available in solid state relay, power relay, plug-in relay, electromechanical relay, octal relay, ice cube relay, square relay, card relay, latching relay and sealed relay (HAZLOC) styles for use in a wide range of process control applications. 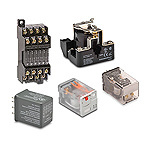 A variety of relay accessories are also available, including: relay sockets, relay removers, protective covers, spare card relays, and metal oxide varistors (MOV) and diode circuits offered as convenient plug-in modules. 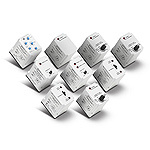 AutomationDirect offers solid state timer relays and digital timers from two leaders in the industry: FUJI Electric and Koyo. All timer relays meet UL and CE conformity. 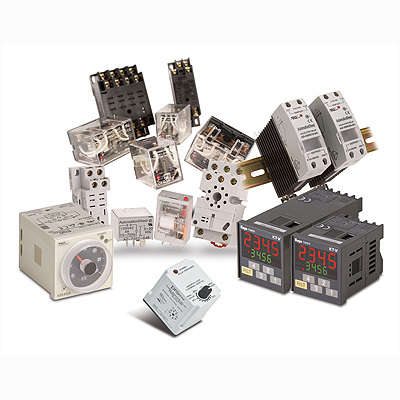 Koyo has been selling timer relays for over 30 years. FUJI Electric has been in business since 1923 and has been selling industrial timers in the U.S. since 1970. All FUJI products are produced under ISO9001 and ISO14000 criteria. AutomationDirect CTT series multi-function devices are easily configured for operation as digital counters, digital timers, combination timer-counters or digital tachometers. Phase monitoring relays provide protection against premature equipment failure caused by voltage faults on 3-phase systems. Alternating relays are used in special applications where the optimization of load usage is required by equalizing the run time of two loads. Pump failure relays are designed to monitor the shaft seals of submersible pumps. 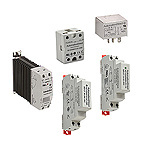 Electromechanical relay switches are available in square relay/ice cube relay, plug-in relay, octal relay, power relay, hazardous location (HAZLOC) relay, latching relay, slim/ card relay, panel mount, socket mount and DIN rail relay styles for use in a wide range of process control applications. A solid state relay switch is a control relay with isolated input and output, whose functions are achieved by means of electronic components without the use of moving parts such as those found in electromechanical relays. These electronic relays are ideal for applications with many contact closures since solid state relay switches offer a greatly extended life compared to electromechanical relays. 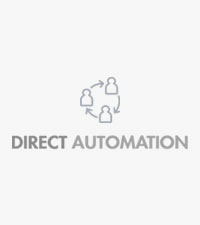 AutomationDirect offers solid state timers and digital timer relays from two leaders in the industry: FUJI Electric and Koyo. All timer relays meet UL and CE conformity. Koyo has been selling timer relays for over 30 years. FUJI Electric has been selling industrial timing relays in the U.S. since 1970. 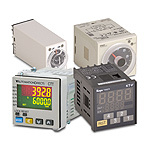 AutomationDirect CTT series multi-function devices are easily configured for operation as digital counters, digital timers, combination timer-counters, or digital tachometers.